Continue reading Disability & Statistics. Inspired by Wikipedia Wikitravel set out in 2003 to provide unbiased up-to-date travel information. Keyword searches on "disabled" and "wheelchair access" result in some useful information - if only, in many cases, observations on how difficult wheelchair access might be! High above the surf - and I mean high, like several hundred feet - a small knot of anglers were wetting their lines over the edge of the (barely) two-lane Amalfi Highway. We had just crossed over a deep cleft in the rock where the bridge spanning it was the original Roman construction. We continued through a tunnel in the promontory that was blasted open as part of Mussolini's nationalization program when we came upon the group. I have always enjoyed fishing - especially fly fishing using flies I have tied mayelf - one of the more active styles of fishing. 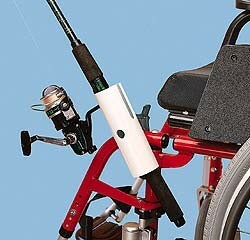 I just might buy this gadget below for a day when I'm in the more sedentary mood necessary for baitcasting. But what I saw there along Italy's Amalfi coastline looked a little precarious than anything I've tried in a while. Continue reading Fishing From the Cliffs of the Amalfi Coast. Along with an endorsement of the Rolling Rains Report Zirma.com has a timely reflection on journalistic standards and the use and misuse of blogging. Continue reading On Mercenary Blogging @ Zirma.com. Robin Smith reflects on an exchange program in Italy in "Observing Inclusive Education in Italy"
Continue reading An Exchange Student's Experience in Italy. Yep, that is the name of it, the "Charming International Hotel," a three star hotel backed up against the Napoli Airport. Part of the Italy Hotel Club the place has a slighly ramped entrance and a well designed accesible room on the first floor. Right across from the room is a terrace with a view of the busy street. 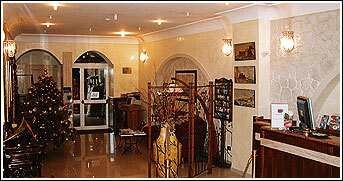 Continue reading Charming International Hotel - Napoli Airport. The trio that defines "doing the Amalfi Coast" Positano, Amalfi, and Positano are a challenge by wheelchair! In Positano we made it as far down the steep streets to the "Residencia Gioia." It was never clear to me if this was the home of the Gioia who invented the compass and launched Amalfi into worldwide naval history because, sitting at the top of the stairs to the church plaza below, I attracted an energetic team of waiters. They were on the way down the hill past me to their afternoon shift at "Le Tre Sorrelli" Restaurant right on the beach. Needless to say, after a bit of trilingual negotiation (Italian, English, and an improvised hybrid with lavish hand gestures), so was I! The day was warm and wonderful. It is pre-season for tourists so only one other table was occupied at the restaurant. Of course, one of the two people at that table was from San Jose, California - a graduate of Presentation High School. Continue reading Positano, Amalfi, & Ravello. Design for Here in the Mezzogiorno - Capture the Sun! I am on vacation. I don't need a brief case for a couple weeks. But if I did, I'd want one from Voltaic. 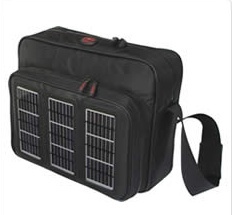 With its three photovoltaic panels for recharging the Rolling Rains Report camera I could sure use a wheelchair bag version. Maybe I'll talk to the Gucci artisans up the road and see what they can whip up for me. Imagining Universal Design: To Build, Modify, or Move? Sandra Fleishman, writing in the Journal Gazette, lists some Universal Design tips in Learn Steps of Universal Design. Capri lies to the West, Naples to the North, and the skyline's dominant feature, Mount Vesuvius, to the Northeast across the Bay of Naples from here in the Grand Hotel Royal in Sorrento. Set right cliffside above its own private beach (elevator closed until May) the hotel commands an unforgettable view day or night. Built about 100 years ago and annually updated it has a venerable feel of comfortable grandeur the marble tiled lobby is full of laquered dark wood furniture embellished with the region's famous inlay work. The first room we were assigned on the second floor while designated wheelchair accessible and with grab bars in the bathroom had a doorway far too narrow for my narrow adult manual chair. To their credit the porter quickly arranged for an upgrade to the third floor. This room, with a few adjustments like removing the bathroom door, can be made to work but lacks either a rolling shower or usable bathtub. If this is the best available at Grand Hotel Royal I cannot recommend it based on accessbility to many with disabilities - especially if travelling alone. However, the level of customer service may make it right for the resilient and physically strong. The owners of the Grand Royal and its siblings, the Maniello Hotels, we8re apparently told by Thompson travel agencyin the UK that they must adopt universal diesign or lose the steay stream of tourists booked through Thompson. To all appearances the owners have opted for obsolesence. Continue reading Capri Across the Strait. Vladimir, my taxi driver to the airport on the start of the trip taught me two things. Second, that when it "rains cats & dogs" on an otherwise warm & sunny day it is called "mushroom weather" in Russian. Mushrooms do well is warm dampness. So today we experienced the "mushroom!s dream tour" of Capri. Continue reading Mushroom Weather on Capri. Some vacations lend themselves to an overarching theme. This one may coalesce around the theme "food!" - eating & drinking my way through Italy. Or maybe, since I felt the urge to pick up a book called "How to Take Good Vacation Pictures" this will be about "seeing." Either way I am looking forward to applying the eye of the artiste to the beauty here through a viewfinder. .
Now This is the Kind of Article We Want to See! Rolling Rains readers often see contributions by Topong Kulkanchit. Topong was one of the organizers of the International Conference on Accessible Tourism in Taipei, Taiwan last May. He is also an extremely effective advocate for inclusive tourism in his native Thailand when he is not on the conference circuit. It Just Got Easier to "Scootaround"
LAS VEGAS, March 3, 2006 (PRIMEZONE) -- Individuals who require the use of a mobility scooter for everyday life will soon have an opportunity to receive a scooter at no cost, through the Clarence Vincent Foundation (CVF). Named after the father of Scootaround's CEO, Lee Meagher, the foundation donates mobility scooters to qualified applicants who apply through one of the foundation's partnering organizations. "We are very proud to carry on my father's legacy and to serve the disabled community in such a tangible way," says Meagher. "Scootaround was founded as a result of my father's needs and it's only fitting that we provide this life-enhancing service through a foundation that bears his name." Continue reading It Just Got Easier to "Scootaround". 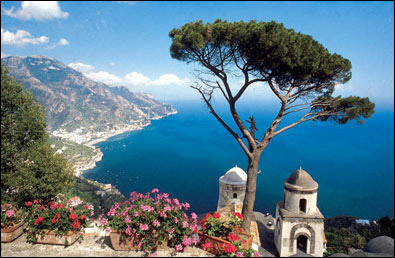 My Amtrak trek through Calofornia has me looking ahead to Italy - even as I spend the day in the sky today & tomorrow. Life would be easier all Italian trains were accessible. (OK, being on time would help too.) I am told that Italy's high speed trains are exemplary for accessibility - and narrow gauge rolling stock is beyond hope. Once you get inside, comfort and safety become important. One of the companies most involved in efforts to improve safety for wheelchair passengers is Q'Straint, United States. It is working with Swedish operator SJ on a project that will provide wheelchair-seated passengers with the same degree of safety as other seated passengers. source: International Railway Journal, January 1, 2006. Continue reading Brazilian Online Accessibility. I had a wonderful chat with her mother here in Anaheim this morning and learned that Kirsten is disabled from a car accident that turned her interest to photography and art. I am looking forward to when she has a show in San Francisco! Continue reading Kirsten Lyttle @ Red Gallery. com. "Already, rest rooms in airplanes are too small to be accessible to a wheelchair user, so doctors often tell disabled travelers to dehydrate themselves before flying." Continue reading Airline Customer Service in a Tailspin. I have been perusing the site for insights into Italy - specifically the Bay of Naples and south along the Amalfi Coast for the next Rolling Rains travelogue. Sorrento will be our basecamp for "concentric circles" of travel at a leisurely pace. And no, I do not intend to rappel through the hillside retreats of Positano and Ravello. Continue reading The Paralympics in Torino, Italy. The last time I wrote about hotel beds I received hearty encouragement from Eleanor Smith, founder of the Visitability initiative. My search for the "just right" bed will never have the worldwide impact of Visitability. In fact, it may put a few people to sleep. But that's not a bad thing. Many who travel using wheelchairs or with parents having mobility difficulties have lamented the trend toward "skyscraper beds." These extra high beds may make for enticing promotional photos with their long legs and impressive display of mattress-top quilting and padding. Short of installing step ladders for entry or taking a flying leap to mount them they remain out of reach for many. The Marriott Suites Hotel in Anaheim, California has hit the "Goldilocks Zone" with more than its sensible height bed in Room 1401. Continue reading Goldilocks Loves Universal Design; Reads Danielle Steel. Do you have an idea for a presentation on Inclusive Tourism? The STS is organized to provide a forum for the discussion of major issues related to accessible tourism for people with disabilities, to identify existing barriers as well as technologies, strategies and approaches to promote barrier-free tourism. No, that's not the title of the internal memo written by the lobbyists who succeeded in allowing offshore drilling out the front windows of these multimillion dollar bungalows. Literally look inland to the East as from Pismo Beach and take in the mountains. Coming South on 101 I roused myself from a nap just before Pismo Beach to see the rugged hillsides. If you read rocks the sight is nothing short of terrifying. The tremendous tectonic forces that shattered the earth's crust here make witnessing Mt. St. Helens blow itself to oblivion seem inconsequential. These hills are the remnants of horizontal layers of rock pushed fractured like peanut brittle and thrust vertically into the blue sky. When the shudder of recognition settled I was left humbled and in awe. The Coast Starliner mini-suite that I reserved for the San Jose to Anaheim, California trip never materialized. More to the point, the train itself never materialized. It was six hours behind schedule when I arrived a comfortable one hour before boarding time. Yes, it appears that I am fated to begin my vacation experience early. I seem to have landed in Italian time even while still here in California trying to make it to the 2006 NCOA/ASA Conference. I have adopted "Romanitas" - the state of being that allows one to maintain equanimity in the face of simple tasks as they drag on to take millenia. Manchester: Can You Afford to Holiday There? Manchester Disabled Peoples' Access Group did an accessibitiy survey from 2002 to 2004. Continue reading Manchester: Can You Afford to Holiday There?. All Roads Lead to ... Disneyland! Actually, I am doing both. The tourist transit system (Anaheim Resort Transit) travels between hotels using the main entrance plaza of Disneyland as its hub. Each bus is outfitted with a Ricon wheelchair lift The design requires the driver to leave the driver's seat to open the access door from the outside, operate the lift, stap (or unstrap) the four wheelchair strap-downs, and then return to driving. Drivers and passengers have been wonderfully good natured about the tedious process but it is easy to wonder why accessible design segregation (disabled passengers as special afterthoughts) rather than Universal Design integration was not used to begin with. Continue reading All Roads Lead to ... Disneyland!. People with special needs and those requiring care are prepared to invest in order to improve their quality of life. This conclusion was reached at the end of the 16th REHACARE International trade fair which ended on Saturday, 15 October 2005 in Düsseldorf. Growing demands on comfort, mobility and living enjoyment as well as demographic shifts in the population are providing strong stimulus to the assistive devices industry. As chairman of the REHACARE workgroup, Richard Isselhorst noted that people with disabilities "are increasingly ready to reach into their own pockets to cover costs beyond those taken on by insurers if the product is right for them and promises greater quality of life”. Continue reading Rehacare: 2005 Report. wheelchair users extra to ride in the same car together. Did somebody come up with a new ad campaign for the travel industry? - "All the injustice that the market will bear." Continue reading Amtrak Derails ADA. I have been preparing for a first trip to Italy - southern Italy near Naples. After reading Carlo Levi's Christ Stopped at Eboli, David Yeadon's Seasons in Basilicata offers another glimpse into unexplored southern Italy. Seasons in Basilicata is a book that defies classification: part travel book, part history, part fiction (so I'm told by a "reliable" source close to the Yeadons), part cook book, part literary criticism. Seasons in Basilicata has an allure that pulls the reader in and reminds us just how unexplored our world still is. source: Reviewer's Bookwatch, February 1, 2005. Look around your house. Check out the front porch, the hallways, the bathrooms, the doorways. If someone who uses a wheelchair or a walker or even a cane came to your home, how easy would it be for him or her to get around? Whether you call it accessible design, visitable design, or universal design, making your home welcoming to all your family and visitors is just plain good sense. Even if no one in your immediate circle has physical limitations, you may have an occasional need to accommodate a guest or a future need to accommodate a family member as the years go by. Of course, if Universal Design was simply common sense - and I do believe that one day it will be considered so - then it would not have taken more than 30 years of continual public and professional education, as well as legislative action, to bring it to mainstream consiousness. Continue reading "It Just Makes Sense...". The Dunas Hotels of the Canary Islands are among the world's innovators in using Universal Design as a central part of their hospitality business. They understand the business value and competitive advantage that comes from Universal Design. Things are about to get just a little bit easier for travelers with disabilities flying into or out of Los Angeles. Tomorrow I will arrive there via Amtrak but for air travelers the new FlyAway bus service begins March 15 shuttling passengers to & fro between Union Station in downtown Los Angeles and Los Angeles International Airport (LAX) terminals using freeway carpool lanes. Unlike public buses, FlyAway buses are designed with luggage bays and feature cushioned seats. Porter service will be available to riders. The new service complies with requirements of the Americans With Disabilities Act. The buses are equipped with wheelchair lifts, and parking slots for vehicles displaying disabled placards or license plates are located adjacent to elevators. Continue reading Transit System & Air Travel System Integration in LA. Last year at this time Air New Zealand joined the backlash to progress for travelers with limited mobility. Air New Zealand enforced its no-lifting policy and grounded wheelchair traveler, Alan Harkin, at Christchurch Airport in mid-February. Harkin, whose able-bodied sister previously assisted him on their UK to New Zealand trip, was suddenly in need of a helper after she was injured in a car accident during their travels. Her injury restricted her from lifting him to his seat. 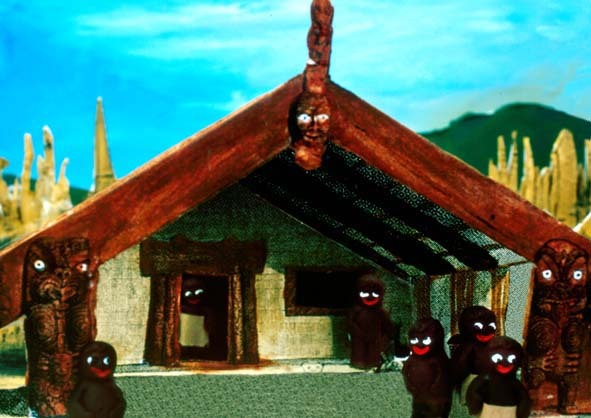 Air New Zealand refused to allow Harkin to fly until a nurse (paid for by his own insurance company) flew from England to New Zealand to assist him in boarding the plane with his sister. Surely this marks one of the most costly (and long distance) temporary care provider scenarios imaginable. Unlike Qantas, which provides able-bodied lifters for disabled travelers, Air New Zealand enforces their no-lifting policy on both domestic and international flights. According to Air New Zealand, they are now testing lifting aids to assist their crew members. Continue reading Air New Zealand Sets Bad Precedent. Wilayah Persekutuan, Kuala Lumpur, Malaysia seems like a desirable place to travel but can it become accessible? Broward County, FL (AHN) - Broward County commissioners have reached an agreement that makes public transportation more accessible to handicapped riders. On Tuesday, County commissioners agreed to pay more than $10 million over the next five years to make bus stops more accessible to disabled residents. The agreement comes amidst a civil lawsuit against the county over almost two-thirds of its 5,000 bus stops not meeting federal accessibility standards. Congress enacted the disability rights laws 16 years ago. The most visible veterans swelling the ranks of travelers with disabilities are usually those with missing limbs or mobility impairments. The Dallas Morning News printed Richard Whittle's report about "epidemic rates of hearing loss among troops" in the Iraq war. This will be a group that is not socialized into deaf culture and will confront the lack of Universal Design on an idividual basis. What design choices are being implemented now that will serve this gowing population? Continue reading Mumbling About War. Teri Adams, who lives just up the road and who, to my embarrasment, I have still not met, recently published this reflection on Universal Design in an essential location -- at the gas pumps. See Universal Design at the Gas Pump over at Crip Chronicles. I like her taste in heroes also -- " Sage Words from One of My Heroes"
It is the most planned for activity by this demographic. Read on about their needs and note how the moment is ripe for Universal Design. Continue reading West Virginia Asks First Wave Boomers About Their Future. Is the Big Island on Your Itinerary? If you plan to visit the Hawai'i you may enjoy the piece by Steve Wright and Heid Johnson-Wright: Big Island Vistas from a Wheelchair.
? Grandparents are part of the family. Older travelers have special challenges with air travel, but except for those extremely unglamorous golf carts with the annoying beeping, little is done to make them feel welcome. Ikeatalia would apply universal design principles throughout its waiting lounges and aircraft, improving the experience for all travelers. Continue reading Fly "Ikeatalia" With Gianfranco Zaccai. Imagine Better: Building Inclusive Community 6-8th September 2006.
conference. The proposals must be submitted by Friday 21st April 2006. Global Access News Travel E-zine is a publication that I am always enjoy. I encourage all Rolling Rains readers to consider a free subscription to this monthly update. Every issue I learn several new and relevant inclusive travel tidbits. The March edition contains articles on Roatan, Honduras, the festering practices of disability discrimination by air carriers, and positive developments in Granda, Croatia, Aruba, and Granada. Here's the piece on Roatan Island's Bay Islands Beach Resort. Continue reading Read Global Access News Travel E-zine. The Cave at Jackson House Bed & Breakfast in Alton, IL was built by Davis Caves. Davis has been building earth bermed and earth sheltered homes since 1976. The eco-friendly sustainability character of the cottage is only part of the attraction. It is also advertised as wheelchair accessible. I wish I had one of these things when I was knocking around in Australia. 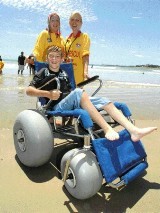 Thanks to a generous local donor you can try these out at Crowdy Head, Black Head and Forster Main beaches in New South Wales. ICTA, the International Commission on Technology and Accessibility, is an important organization for travelers with disabilities. You may never meet anyone from the organizatiion. You may never even hear of it again but it is out there working for us 24/7 all around the world. 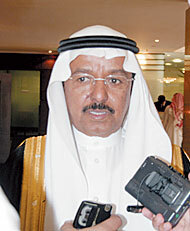 Continue reading On ICTA & Saudi Arabia's Progressive Building Philosophy. Accessibility to Zoning Conference (July 13-14, 2006). Continue reading Call for Papers: Universal Design. Aruba on your itinerary? 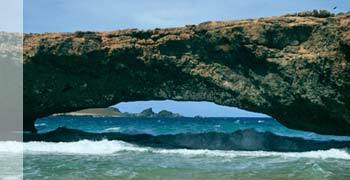 Here's a resource --Travelers with disabilities Aruba.